The 2015-2017 Artmobile exhibition was Surrealism: Visions of the Mind. The exhibition featured 15 works of art from 15 different artists from seven different nations. 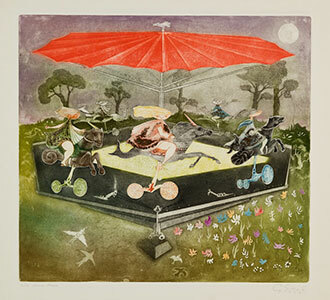 In a broad view of 2-Dimensional Surrealist approaches the exhibition includes etchings, lithographs, a monotype, an intaglio, an engraving, and a painting. Participants typically work with Artmobile Educator, Erica Ramsey to explore the history and processes of Surrealism through a structured deep looking activity followed by an art making activity. Funding for the Ann Simpson Artmobile Program is provided by the Ann Simpson Artmobile Endowment established by the Julienne Michel Foundation and with the support of Helga and Erivan Haub, Ann and Alan Simpson, and an anonymous donor. The Artmobile van is provided by the TRONOX, Ann and Al Simpson, and Rocky Mountain Power Foundation and other generous donors. Additional support is provided by TRONOX, Union Wireless, and the Wyoming Arts Council through the National Endowment for the Arts and the Wyoming State Legislature. Right: Guillermo Silva (Columbian, 1921, 2007), Luna Lena, 1966, etching, 17-1/2 x 16 inches.